"As soon as a treatment strategy which is effective becomes available, being able to detect people who are normal but at great risk of developing Alzheimer’s disease is very important," Leyla deToledo-Morrell, professor of neuroscience at Rush University Medical Center and senior author of the research. "They would be the best population to treat before further damage occur." Alzheimer's begins as mild cognitive impairment, and may take more than 10 years to progress into clinical dementia. There are about 5 million people in the U.S. with the disease, and the number of caregivers is on the rise. Besides memory loss and disoriented thinking, patients may turn violent. But even before the initial symptoms, brain changes such as those described in the study are already taking place, scientists say. Researchers studied two independent groups of adults who were cognitively normal –showing no signs of dementia– when first scanned. Participants were all aged 65 and older at the start of the research. In the first study group, eight people eventually developed Alzheimer's dementia after an average of about 11 years, and 25 remained normal. The second group included seven people who went on to develop Alzheimer's, after an average of about 7 years, compared with 25 who did not. Brain scan results from both groups indicate that key brain areas were likely to be smaller in people who would develop Alzheimer's nearly 10 years later. Some of the areas are involved in memory, but the shrinkage was not extensive enough to affect their memory at the time of the brain scan. Of the 11 participants total who began as cognitively normal and had low cortical thickness in particular brain regions, 55% went on to develop dementia. "These people who are 'normal' are really not normal," said deToledo-Morell said. "They’ve already started showing the signature of the disease. However, cognitively they are not affected yet." This particular study looked at "incident Alzheimer's disease," which differs from "familial Alzheimer's disease" in that the latter has genes associated with it. Familial Alzheimer's starts at a much earlier age and affects smaller proportion of the population. As researchers try to develop treatments based on early indicators such as this, the question becomes: Would you want to know your risk? Share your thoughts in the comments. Next entry »Is secondhand smoke really that risky? Yes, I wish my siblings and I couldve detected the Alzheimers which took my father too young. After 5 years losing my mother, my father was diagnosed with Alzheimers. He was 72 and had always been active (worked in construction) and was not on any medications and appeared healthy. 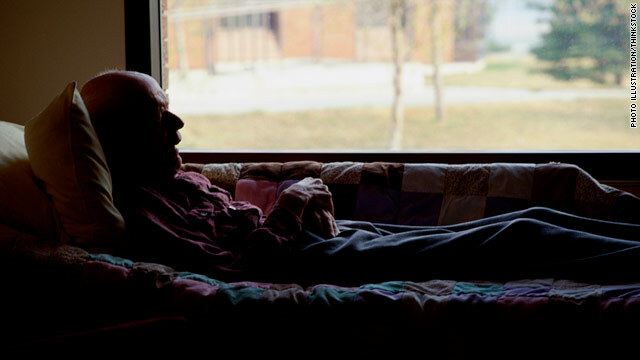 Once he was placed in a nursing home by his "new" wife, he declined and died there. Four days before his death, he was able to feed himself and walk. Strangely enough the one weekend none of his children visited him, he slipped "unconscious"? Doesnt make sense! sorry to hear that. watching a loved one with this disease is really difficult, but can you imagine what it is like for them? my grandmother would have those moments, realize it happened, and ultimately i think felt quite hopeless. they are stripped of so much with this disease, and quite suddenly at times. and to be cognizant (even if off and on) that has to be difficult. my grandmother quickly went downhill after going into a place too. she had been such a strong, vibrant and independent woman. part of me wonders if losing that and in her mind being "put away" didn't make her feel even more hopelessness during her more cognizant moments. and therefore losing the will to fight. i don't know, but i know it's very hard to come to terms with as the loved one watching and being helpless to stop it. My father developed Alzheimers in his late 70's. In his early 80's he could no longer be alone. I quit my job and cared for him for almost 10 years. At almost 90 he was still mobile and as active as could be expected. Yes, he was a handful, but I felt he deserved better than a nursing home. He died at home shortly before his 90th birthday. I firmly believe that we would have lost him many years before if he had been in a nursing home. I installed key locks on the inside of the outside doors so he couldn't get out and baby gates that he could not open for the parts of the house that were not safe for him. Also had a bed alarm so could tell when he was trying to get up. There are ways to care for you loved ones at home, you just have to be creative. If at all possible, keep your loved ones at home. They will live longer and happier even with this horrible disease. The tests you endured have 0% chance of predicting your chances of developing Alzheimers, sorry. You're an even-numbered Chief, so there's no hope for 'ye. Already dreading what may be the inevitable, I'm not sure I want to know ahead of time. Maybe so I could close out my life and get ready for the nursing home. All this talk about cutting the budget, when if the rich and big corporations would contribute their fair share of taxes, there would be enough money to find a cure for Alzheimers. We need answers now, before the huge baby boomer generation gets at the age of developing the disease... or our health care system will be overwhelmed. Sir maybe knowing ahead will help you or maybe not...I will explain....my mother is 86 and sharp minded,does her math,remembers phone numbers, reads ,plays domino everyday at the Senior Center that she attends 5 days a week,does crafts. My uncle too was sharp minded, remembered everything and did crosswords everyday all his life. He worked up until he died at 93. My cousin will allow him to keep busy"work" at his factory so he wouldn't get bored. He will make sure that the employees took their lunch on time and returned on time too.. My mother too worked up until she was 73 as a nursing assistant. Perhaps keeping busy and learning something new constantly exercises the brains and doesn't allow it to decay. Good luck! My maternal grandmother developed alzheimer's in her late 60's. My mother in her mid-60's. I spoke to my mother's doc about having my mother tested for familial Alzheimer's, but she counseled me against. She said since there is nothing I can do if I have the gene, I should not test. Any other thoughts? if there is a test and the result wouldn't affect your insurance premiums, i would do it. that way you could prepare yourself and your family for what the future may hold. additionally, you could do some of your own research on it. For instance, I would use the information for myself to find a living situation/long term care/nursing home where i would prefer to be when the time came and choose that for myself. and i would start saving for it/finding out where the money would come from, so i would be less of a burden to my child/family. who knows, they could find something that helps stave it off or lessen the symptoms not too far down the road even though there isn't yet a cure. something like that could do a lot for your quality of life while you're here and give you more time with family, friends and loved activities. I'd say that's up to you...not up to the doc. Personally, given that there's currently no effective treatment for it, I don't think I'd want to know, personally, but that's me. This is a decision for an individual to make, and I think it's unconscionable for a doctor to flat out tell you not to be tested. Another way to look at it: someday there may be a treatment for it...scientists are working on it...and knowing that you're at risk for it could conceivably put you in a position to get into clinical trials early. Good points icrabbitppl and Audrey. I will try to figure out if I can have the test done anonymously. Dear Wondering.......get yourself another doctor. My precious Mom and I have never lived apart. She helped me raise my son, who is now 32. She worked full time until age 75. Now she is 82 and in stage 5 of Alzheimer Disease. We have kept her at home as long as possible. It is breaking our hearts to place her in a facility, but the constant care is wearing us out and our job performance is being affected. We will visit daily, but we know we are doing the best thing for Mom's safety. She could so easily waunder from the house or open the door to a predator. God bless all who struggle with this decision. JemRose, If you find the right facility it may be the right decision for all involved. Not all facilites are horrible. My 86 year old mom was diagnosed 3 years ago and she is in a facility that takes great care of her. Don't feel bad that you are at this point in her care...If you find a safe place for her you are doing the right thing. We put alot of guilt on ourselves when we make these kinds of decisions, but we really shouldn't. We know we have done the best we can. My father has dementia and in independant living right now. I know we will be going down the same path with him someday soon. You do what you have to to keep them safe. Jemrose, I truly understand your pain. I too had to place my mom in a facility after caring for her for years. It does get to the point where you just can't do it anymore. Putting my mom in a nursing home was the hardest thing I ever did.. but I eventually realized it was the best thing for both of us. I was able to see her every day and spend quality time . In a short while I realized I was just running on empty and unable to see things clearly.. Take one day at a time and everything will be ok. One suggestion I will make is get to know your mom's caregivers in the home and spend as much time there as you can. Yes I agree with all the people who hope to and plan to check out before they are too far gone. Pray for a cure or legalization of assisted suicide. Something CNN neglects to report, is that the only way to diagnose alzheimers for certain, is with an autopsy. my mother in law suffers from Dementia, with many of the symptoms of Alzheimers. but there is no way to know for certain till she passes away, not that it matters, she is effectively dead now, with no vestige of her personality left. what both saddens and enrages me, is when I compare a disease that 20 years ago was a death sentance, with the progress made in Alzheimers research. look at the attention AIDS has gotten due to the high profile Hollywood deaths, and the fears of an epidemic. but when you compare the statistics, far more people die from Alzheimers in this country than AIDS. even those that do die, do so with a far higher quality of life than those that have their very minds eroded away like a a sand castle in the surf. compare a disease that in the vast majority of cases in this country, is entirely preventable, with something that can strike anyone. I wonder, how much money has bed spent on AIDS research as compared to Alzheimers? Excellent point - this disease will be devastating to us Baby Boomers, and you would think it would be in our own self-interests to have telethons, fund-raisers, etc. This is a disease many of us could be suffering from right now, but as we are in younger or middle-age years, no symptoms are evident. We need to press for much more research to find a viable treatment to slow down or stop progression, not to mention a cure. Well, I don't think I would like to know if I had the shrinkage way before I had the symptoms, mostly because I know that there is no treatment, basically, except lifestyle changes, which I'm already incorporating into my daily routine. I think that by knowing I'm going to get this disease would just freak me out and stress me that I would die from panic long before I died from Alzheimers. and Jae -dying from panic is probably more humane than dying from Alzheimers. Where is assisted suicide when you need it? Edith, I couldn't agree with you more!! I am making my own plans while I continue to search for a compassionate M.D. They do exist......just few, and far between. Well, if I were diagnosed with Alzheimer's I think I would want to suicide before having to enter the custodial stage. I would rather my children make better use of my estate than to see it drained away with the care of an idiot. I think my loved ones would understand my actions and be spared a good deal of emotional drainage by a quick demise. I agree with you 100%. My grandmother had alzheimer's and died in her 70s. My dad was diagnosed with early-onset alzheimer's in his early 50's and recently died. It was devestating to watch and now I, in my late 30s, worry about my chances of not just getting alzheimer's, but getting early-onset. Everytime I forget a word, or lose something, it scares me. But, I have made a decision already, that if I am diagnosed with Alzheimer's I will not die a slow, painful, horrendous death. I will find a way to take my own life so that my children do not go through what I did. I am a Christian, but I do not believe that God wants people to be tormented, and that is exactly what my dad went through. The statement =patients may turn violent= does not belong in this article. I have diabetes 2 and if you jerk me around, I will clobber you as necessary to make my point. Dystopiax -" patients may turn violent" does belong in this article. Alzheimer's in addition to taking away a person's memory also takes away their ability to understand appropriate behaviour. They often physically lash out because they no longer verbally express their frustrations in a socially appropriate manner. This can be dangerous for an in-home care giver that may not be physically stronger than the Alzheimer's patient. True. My small, frail, 70 year old grandmother with Alzheimer's became angry and lifeted a 6' 2" large man up in the air and shoved him against the closet because she misunderstood and thought he was hurting her husband (he was the caregiver at the time and was feeding my grandfather. Violence is part of the disease, unfortunately. I forgot what I was gonna post. icrabbidppl There are too many variables involved for the test to do people a lot of good. First of all, only a few of the genes involved in the disease are known. Secondly, even twins with identical genes do not always have the diseases they have the potential genes for because there is another set of things in the human body that controls how the genes are expressed. Your twin might have the disease and you would not because the gene was turned on or off at a different time by your body chemistry. Thirdly, the disease takes such a long time to progress that you might very likely die of something else before it manifests itself. In other words you might not need a nursing home. Fourth, having treasured possessions around you and familiar surroundings is more important than where you are because they provide memory cues you can use to validate what your sense are telling you are true. Research in areas of brain surgery psychology has shown that when a part of your brain is cut so that the two halves of your brain can no longer talk to each other and the half of your brain that does not handle communication outwardly is whispered to by whispering in the ear linked to it (right half of the brain controls left half of body and vice versa) the patient will follow the directions. When asked why they did the action they were ordered to do they will have no idea why they did it but will make up a story to explain it. If you have beliefs not connected with reality and you can see by what is around you that they are not real you can accept that. If you have no way of checking and being sure what do you do? A quick note for those with loved ones needing help. Not all dementia has a physical cause and some has, in the past, 1970's or so, been helped with a system called Reality Orientation. This is not the same as the psychological system of Reality Therapy used by Dr. Glasser and others but is a system of keeping the patient informed about what is going on in the world on a daily basis. It was shown before the 1970's to be of value in geting patients to progress enough to move from the back wards of psychiatric hospitals to the front wards to interact with other people and not just sit in their room all day. It is not a miracle cure but is better than doing nothing and it takes a long time to see results. Doctors used to, and might still, write it in charts as tolerated. Ask a doctor of rehabilitation recreation department member.